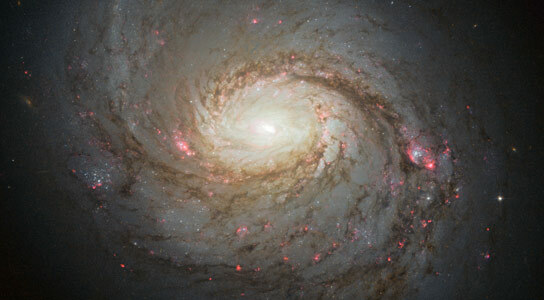 NASA’s Hubble Space Telescope views spiral galaxy Messier 77, also known as NGC 1068. 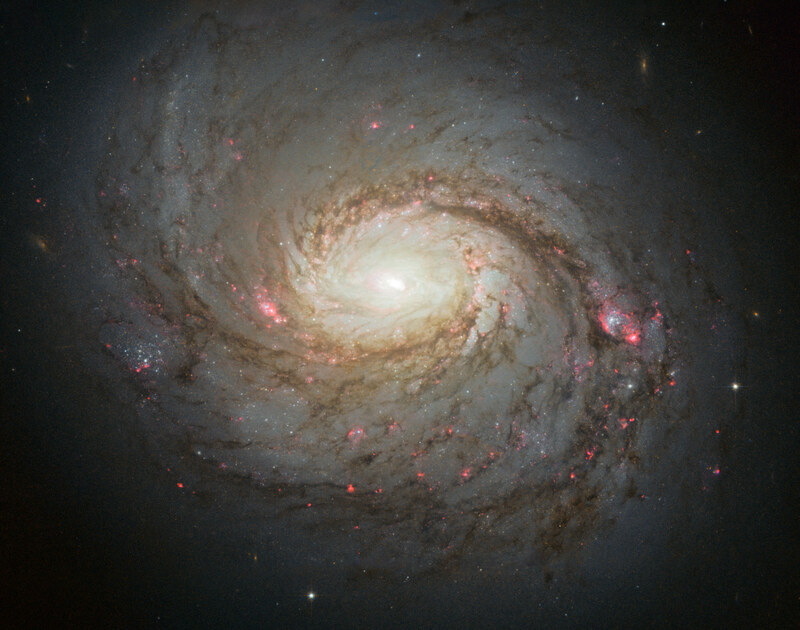 The NASA/ESA Hubble Space Telescope has captured this vivid image of spiral galaxy Messier 77, one of the most famous and well-studied galaxies in the sky. The patches of red across this image highlight pockets of star formation along the pinwheeling arms, with dark dust lanes stretching across the galaxy’s energetic center. Messier 77 is a galaxy in the constellation of Cetus, some 45 million light-years away from us. Also known as NGC 1068, it is one of the most famous and well-studied galaxies. It is a real star among galaxies, with more papers written about it than many other galaxies put together! Despite its current fame and striking swirling appearance, the galaxy has been a victim of mistaken identity a couple of times; when it was initially discovered in 1780, the distinction between gas clouds and galaxies was not known, causing finder Pierre Méchain to miss its true nature and label it as a nebula. It was misclassified again when it was subsequently listed in the Messier Catalog as a star cluster. Now, however, it is firmly categorized as a barred spiral galaxy, with loosely wound arms and a relatively small central bulge. It is the closest and brightest example of a particular class of galaxies known as Seyfert galaxies — galaxies that are full of hot, highly ionized gas that glows brightly, emitting intense radiation. Strong radiation like this is known to come from the heart of Messier 77 — caused by a very active black hole that is around 15 million times the mass of our Sun. Material is dragged towards this black hole and circles around it, heating up and glowing strongly. This region of a galaxy alone, although comparatively small, can be tens of thousands of times brighter than a typical galaxy. Although no competition for the intense center, Messier 77’s spiral arms are also very bright regions. Dotted along each arm are knotty red clumps — a signal that new stars are forming. These baby stars shine strongly, ionizing nearby gas which then glows a deep red color as seen in the image above. The dust lanes stretching across this image appear as a rusty, brown-red color due to a phenomenon known as reddening; the dust absorbs more blue light than red light, enhancing its apparent redness. A version of this image won second place in the Hubble’s Hidden Treasures Image Processing Competition, entered by contestant Andre van der Hoeven. 1 Comment on "Hubble Views the Hidden Depths of Spiral Galaxy Messier 77"
Don’t tell me there isn’t life out there! What on earth (no pun intended) is it there for if not for life to evolve?